Protect your fruit crops this year with a good quality walk in fruit cage. With so many types available it can be challenging to choose the right one for your allotment or garden. Follow our advice and where to buy great, value for money, walk in crop cages. Excellent value for money. Made from rust resistant aluminium this cage is a perfect entry level model for those just starting out in fruit gardening. With an optional door and corner braces for added strength in exposed areas this cage is one the cheapest we have found whilst not compromising on quality. We think these are exceptional value for money. Made from strong, thick aluminium tubing and galvanised locking fittings these really will stand up to the weather. 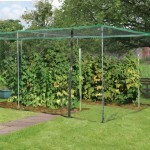 With a multitude of sizes, doors and accessories available you need never worry about the safety of your crops again. Two Wests fruit cages are available here. 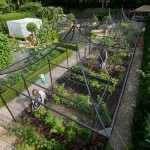 A fantastic, economic, UK made fruit cage from Harrod Horticultural. Using 16mm aluminium tubes for the frame and their patented ‘slot and lock’ connectors assembly is pretty straightforward. These frames are made from galvanised steel that will resist rust and come with a 10 year guarantee (economy version). The upright poles are 19mm steel tubes, slightly heavier duty than the 16mm models on offer from other suppliers. This model also has a door as standard, not as a costly extra. 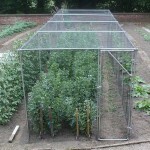 The fruit cage on offer from Northern Polytunnels is made from 25mm galvanised steel poles and like others quoted here comes supplied with a door, netting and clips as standard. Many size configurations are available starting from 2.5 x 2.5m. For those wanting a walk in fruit cage that oozes style then this could be the model for you. Priced from £615.00 it is the most expensive to make our list but is certainly the most stylish. An overkill for an allotment but would look great as part of a home vegetable and fruit garden. If you have ever used a small fruit cage you will know how frustrating it can be to access your crops. 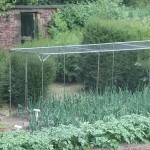 Netting tangled up in foliage is a common problem as is plants outgrowing the frame and netting. General access becomes difficult, all of a sudden that relaxing trip to the allotment becomes one full of awkwardness. Small fruit cages also restrict the varieties of fruit that can be grown. Whilst they might be suitable for smaller soft fruits such as gooseberries and blueberries they are quickly outgrown by taller raspberry, apple and fig varieties. A walk in of cage, preferably with a door, will take away these frustrations and make fruit growing a much more pleasurable experience. Protecting crops from birds is top of the list for the fruit gardener. Installed correctly and choosing the right netting and a fruit cage will also give protection from small mammals and butterflies (no more caterpillars). For those wanting the more rustic, traditional look then a cage made from timber is a good option. Wooden fruit cages tend to be the most cost effective solution but there are drawbacks. A wooden cage is constructed by a series of upright 4″ timber posts with supporting cross pieces of timer to provide support for the roof netting. there are a couple of drawbacks to using a timber frame. By its very nature, wood rots after a few years and to have a sturdy frame that can be relied upon the posts are going to need to be cemented in the ground. This is a heavy job, lugging bags of premixed post cement through an allotment in a wheel barrow. The materials the frame is constructed from is going to be the difference between a cage that lasts just a few seasons or one that goes on to last for years to come. Steel and aluminium fruit cages are the most common types purchased. Most systems are expandable by adding extra poles and connectors. As your fruit garden grows so can your fruit cage. The biggest advantage of aluminium based fruit cages is they will NEVER rust. Giving you year upon year of reliable service. If you have chosen one of the fruit cage kits from above then installation is as straightforward as slotting the cage together and pushing the uprights into the soil then attaching the door and protective netting. However, if installing the fruit cage on hard and stony ground we would recommend using a ‘hole former’. These can be purchased with the fruit cage. Care for your Fruit Cage. There really is not any needed apart from removing the netting should heavy snow be forecast. Heavy snow will settle on the netting and the weight of this could collapse and possibly terminally damage your prized purchase.